On the 30th of November, one day before the kids were allowed to open their advent calendar, I saw that Awena had already took out 3 chocolates out of hers. Unlike her sister, she is just someone who doesn't listen to her parents. Hubby caught her hiding the chocolates in her room. On the second day of December, six chocolates were gone, amid our warning that she would soon run out of it, and someday she would just see her sister eating chocolate while she has non. The warning didn't work, she refused even to open the box by date. She just randomly chose the boxes she wanted. On the fourth day of December, she decided to open all the boxes, got out all the chocolates, and laid them on the floor. 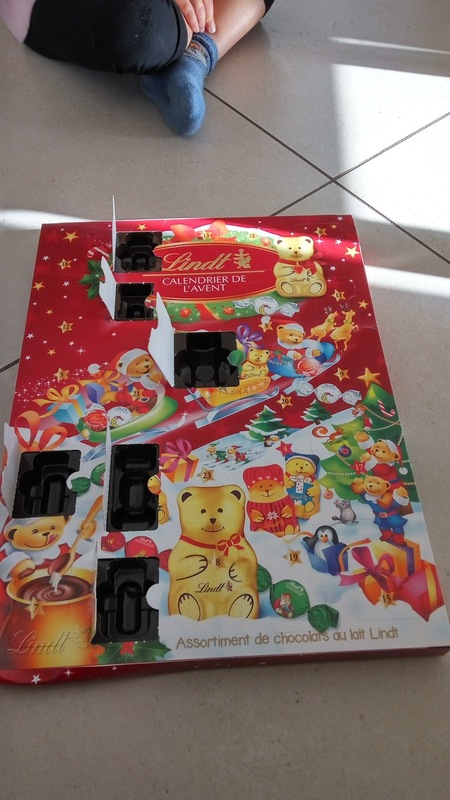 On the 7th day of December, all the chocolates were eaten. Meanwhile, the big sister follows the rule, she patiently enjoys a chocolate per day. Maybe that's because she's three that she doesn't understand things, or that's just her nature personality. She is just so different from her elder sister. When we said no to candy, the elder one was disappointed but did nothing. Whereas the younger one, she smiled at you, did nothing in front of you, but eventually you would find out that she ate a candle, at your back. I hope things get improved. The house is a mess permanently and 80% of the damages came from her. She is just so unbearable. I had the same issue with Mark the previous years. And he told me my in-laws bought him a calendar and just gave them all the chocolates... in November. Yet, we do the calendar at home, and he's very good at opening one every day. It's coming, he gets it! My 3 year old daughter is the same as Awena, doesn't listen much to what I say. But the advent calender, she managed to eat one per day but I keep the calendar above the fridge after she gets one. As for the mess, our house is permanently messy. I would be ashame if someone drop in at the door unexpectedly. I hope this is only a phase. I thought terrible "twos" phase was difficult. Is your daughter difficult when it comes to cloth? Mine won't wear hat and gloves. She would tolerate "la capuche" and then removes it at the gate of the school. She already knows what being uncool means at 3! sigh.